Medical and Scientific Advisor at bioMérieux, in charge of Global and Tropical Infectious Diseases and Global Health. 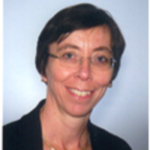 Françoise Gay-Andrieu is an MD-PhD, HDR, specialized in Parasitology-Mycology. She graduated from Grenoble Medical School, France, before completing her specialization and PhD in Lyon University. During her training period she had several experiences and internships in tropical areas and developing countries, where she felt a very high interest and motivation for tropical medicine and global health. From 2002 to 2004, she worked as a Technical Assistant of the French Cooperation in Niger, where she was the head of the Medical Biology Department in Niamey National Hospital. She came back to France to take a position of Associate Professor at Nantes University Hospital, France, as head of the Parasitology-Mycology department. From 2010 to 2012 she was a Visiting Scientist at Georgetown University, Washington DC, where she worked in Drug Discovery on the identification of mechanisms of action of new antifungals. In January 2014, she decided to move to the industry and joined the Medical Affairs and Public Health Department of bioMérieux, France. Through these successive affiliations, Françoise gained a large experience on malaria, toxoplasmosis, mycology and tropical diseases. She also has an experience in teaching, management, laboratory strengthening in resource-limited countries, and has more recently acquired an experience in the strategy and challenges for the development of in vitro diagnostic products. Françoise is Vice President of the “Société Française de Pathologie Exotique”.